Lets see, my page......or is it........THE SILKIE PAGE? 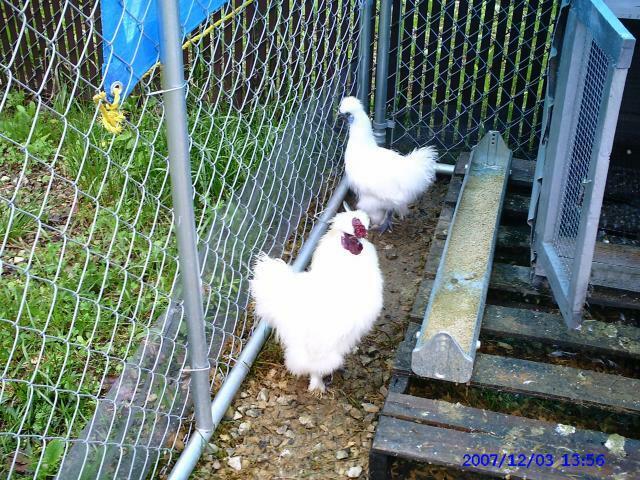 I am definitely a SILKIE Lover and I began breeding them over 3 years ago. Can't keep enough eggs, or chicks, or even my cockrels. Which is good! And now that some people have tasted my eggs, they won't go to the store to buy them. ( Bragging) Anyway, I have never tried my eggs, never had a chance, been selling too many. Tehe! Guess I better taste them and find out what all the fuss is about. About me; married, 51 (OLD), 5 children 6 grandchildren, and thank GOD no Great GrandChildren yet. Homei s in Kentucky! Actually from Chicago Illinois, but spent the last 18 years in Florida/Georgia/Texas and well Kentucky. I love my horses, SILKIES of course, and my dogs and cat. We are just a small producer of hatcherable and edible eggs. But we love what we do and the chickens we do it with. Here is a photo of our Chief Roo and one of his Wifies.